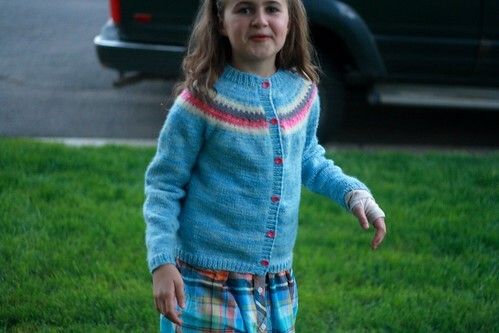 I have the annual goal of giving my children a new handknit sweater each autumn. Last autumn, because of my husband's illness among other things, I got very behind. And then Christmas came, and I had other distractions. In January I decided to pick them back up and get serious with their completion. 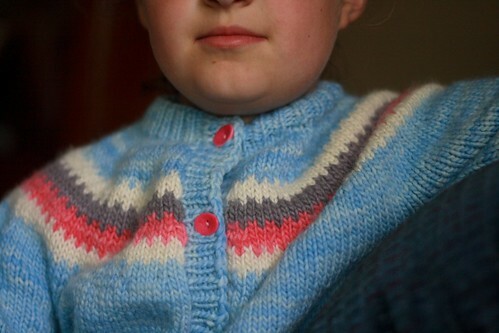 I looked at the three sweaters in their various states of completion and assessed the situation. James's sweater was completely knitted, but not seamed. There were 30-35 ends that had to be woven-in. 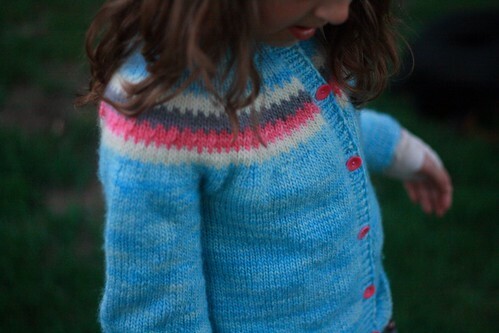 Fiona's sweater was complete except for the button bands. Elisabeth's was complete up to the underarms. I decided to begin with hers since it was the farthest from completion. But I realized almost immediately (since it was no longer a surprise, I tried it on her) that it was much too small. I'd had some gauge problems and then the pattern itself seemed to have sizing problems. I ripped the whole thing out and started over, changing the gauge and the size. The result was a sweater that was much more pleasant to knit and fits her much better, although it's still a little bit small. I worked on it sporadically from late January until late May, completing Fiona's in the meantime. (Fiona got a lot of use out of hers from early February on, and you've seen it here and there. A full post devoted to it on Thursday, though!) 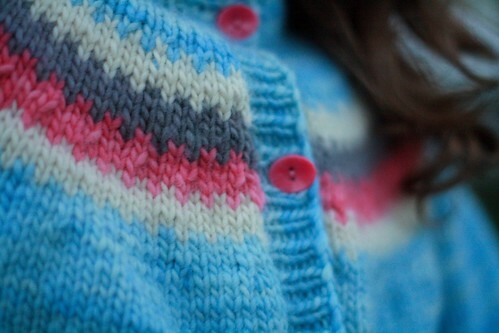 I finally sewed the buttons on Elisabeth's sweater about 10 days ago and she's worn it a couple times on chilly evenings. Elisabeth wears a 9-10 in ready-to-wear, although she is very thin and could get away with even smaller sizes around if it weren't for her height. 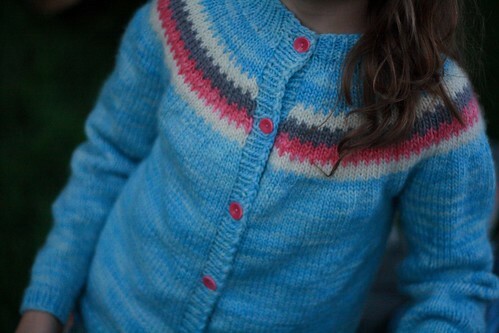 This sweater is the size 10 from the pattern, knit with a larger gauge (4.5 stitches to the inch rather than 5). The sleeves are a bit too tight, and I added almost 4 inches to their length. I think the body fits just right but if she were an average size 10, it would be snug. 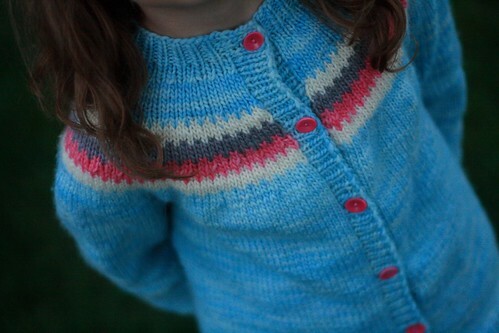 Anyway, I didn't love the sizing in the pattern, but I do love the overall look of the sweater. Complete just in time for temperatures in the 90's!